For many years athletes with significant physical disabilities have participated in fencing. Initiated in 1953, wheelchair fencing was introduced internationally in the Stokes-Mandeville Games in England in 1955, and in 1960 wheelchair fencing became a sport in the Paralympics. 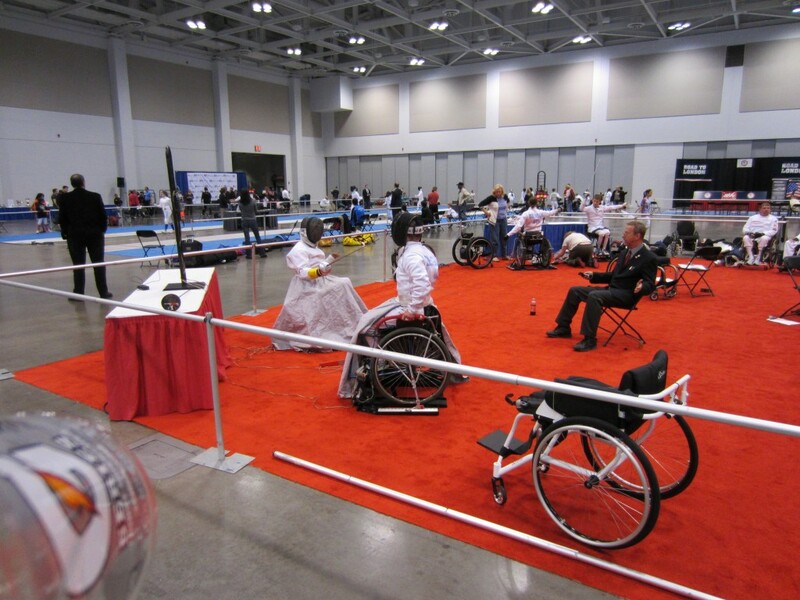 Today wheelchair fencing is an international sport governed by the International Wheelchair and Amputee Sports Federation and USA Fencing with great opportunities for wheelchair athletes to compete regularly in national level tournaments and represent the United States in international championships and the Paralympic games. Paralympian Gary Vanderwege of Texas referees a wheelchair bout at a North American Cup in Richmond. The development of fencing for the blind has been slower than that of wheelchair fencing. Fencing as a rehabilitative activity for the blind dates back to the treatment of war wounded in Europe during World War I. However, today events for blind fencers are included in major Italian fencing tournaments; there are developing programs in Sweden, France, and Belgium; and Oklahoma Sport Fencing in Edmond, Oklahoma, has a competitive programs for blind athletes. 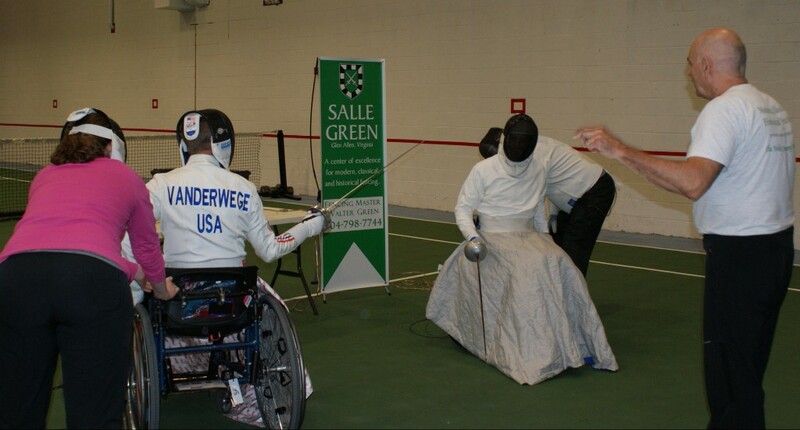 Salle Green is prepared to work with any athlete with a disability who is interested in learning to fence. We cooperate with Sportable, the adaptive sports organization in Richmond, in our programs in fencing for those with disabilities. For both wheelchair and blind athletes there are classification standards to identify the degree of disability and any accommodations required. Our model is to integrate fencers with disabilities in our normal classes with adaptations to allow both able bodied and wheelchair or blind athletes to participate together. The speed of wheelchair fencing and the importance of searching patterns and recognition of blade pressure and touch in blind fencing make these valuable experiences for all fencers. If you are interested in trying a very different individual sport with great opportunities for growth and success, please use our contact form or telephone 804-798-7744.